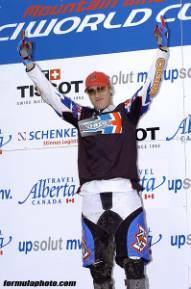 Ketchum, Idaho, August 4, 2004  Smith Optics congratulates Steve Peat on securing the 2004 World Cup Downhill championship title. Peat capped a run of podium appearances on the World Cup Downhill circuit with a solid third place finish in Calgary ensuring the overall World Cup title with one race still left on the calendar. He goes into the final round with a 271 point advantage over his closest competitor, Sam Hill. Considering riders can earn a maximum of 250 World Cup points in a given weekend of downhill, its safe to say Peaty has garnered yet another prestigious title. Peat has been dominant on the tour this season with a hungry pack of challengers snapping at his heels each step of the way. He began the season by winning the World Cups opening round in Austria and never looked back. 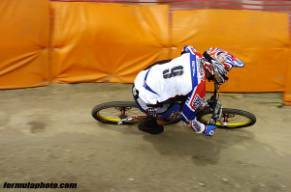 As the season pressed on and Peaty began to pull away from his competition, it was time to turn his focus on the one title he has yet to put next to his name  World Champion. In the coming weeks, Peat and Co. will begin applying the finishing touches to the season as they head to the 2004 UCI World Championships in Les Gets, France. With the rainbow jersey on his back, Peaty will have won every title within his reach. Based in Sun Valley, Idaho, with a Southern California office located in San Clemente, Smith Optics, Inc. was founded in 1965 with the creation of the first goggle featuring a sealed thermal lens and breathable vent foam. Today, Smith is as well known for its diverse line of fashion and performance sunglasses as it is for its goggles. From Smiths distortion-free TLT Optics to the versatility of the Interchangeable Series, with its patented, interchangeable lens system, the devotion to excellence, innovation and style is what has made Smith goggles and sunglasses the choice of action-sport athletes worldwide. Smith products are sold in more than 50 countries through sporting goods and specialty stores. For more information visit www.smithoptics.com.